For most areas in the world there is someone we can turn to for advice. Doctors, Lawyers, Architects offer counsel in their respective fields. In personal finances, there was no one until now, to offer client-centric advice. 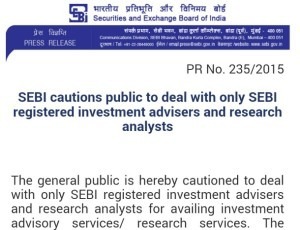 SEBI has created a new class of Advisors – Registered Investment Advisors ( RIAs ) – who are to act in Fiduciary capacity & offer client-centric advice. Fiduciaries are those who put the client’s interest ahead of everything else, including their own interest. Conflict of interest will be minimised or non-existent in this model. Investors can now access advice truly in their best interests. There is an allegation that RIAs are doing pretty much what distributors are doing. SEBI regulations allow those transitioning, a dual role. There are corporate advisors who have both advisory & distribution divisions. There are individual advisors who have relatives/ friends doing distribution. But then, there is segregation of activity, arms length dealing, full disclosures of any conflicts of interest & option to the client to source products from anywhere. There is a legal Fiduciary responsibility, annual process / compliance audits & possible inspections. So, it is not really the same. There are also many fully fee-only RIAs too, which is the ultimate destination for RIAs. RIAs are registered with SEBI as Fiduciaries & hence customers can fully expect them to put their interest first. RIAs represent only their clients, their advice is aligned to client’s specific situation & are well qualified as per regulatory requirements. Paying an advisory fee separately for advice provided ensures that investors get back control over what services they get and what they pay for it. In product distribution situation, the commission is collected and paid to the agent by the principal, irrespective of the service quality – which is a problem for an investor. RIAs collect fees for advice rendered. The important fact to remember is that RIAs also suggest commission free products, which lowers the cost to investors. For instance, Direct Plans of equity MFs & Debt MFs are on an average 1%pa & 0.5%pa lower in cost as compared to Regular plan ( where commissions are embedded ). Likewise, many RIAs are offering commission-free products in various categories – PMS, AIF, P2P lending, Debt products etc. All these together significantly lowers the cost to clients. RIAs offer a range of services to clients like Financial Planning, Plan reviews & Portfolio reviews, Quarterly client engagements, Estate Planning services, Life Planning services etc. Such services would typically be available to clients who have engaged them for a fee. After taking into account the savings, the client would overall pay the same or lower outgoing amounts and would also get a range of advisory services from the RIAs. There are different fee charge mechanisms which RIAs use. Some charge a lumpsum fee while some others charge as a percentage of profits & yet others a percentage of Assets under Advice. There are many other hybrid models which use flat-fee to an extent & variable fee beyond that. Firstly, the fee-charging mechanism is a matter of which model works well between the client & the advisor. Many clients want to pay based on what they earn – it is a psychological thing. They are willing to pay more when they earn more & many times they insist on such an arrangement. For some advisors this works well as there is participation in any upsides which the clients enjoy, especially in a profit sharing model. In the AUM based model, they get paid higher amount when the Corpus they manage goes higher. They are paid more for the work and the responsibility that goes with it. The analogy is that of a CEO of a company who spends the same 8-10 hours a day, but may earn multiple crores, which is far higher than what even a senior management person may be paid. He is paid more for the responsibility he is shouldering – that of giving a vision and moving the company itself in a particular direction to achieve certain agreed objectives. These advisors fashion themselves like the Personal CFOs of their clients & offer a range of services for their clients. So, in these two mechanisms, the fee is a percentage of either the profits or assets. There are also those who work on a flat-fee model of engagement. In this model it is mostly based on the amount of work and the time spent for doing that work. This is a transactional kind of a model, which again works well for people who are looking for specific services/ engagements. In a hybrid model, there are a certain set of services which are offered for a flat fee & further services offered for which a variable fee is charged. The fee & service arrangement are usually discussed & decided upfront by the investor & the advisor. The important point is that the advisor would work in their best interests as a Fiduciary, irrespective of the fee arrangement chosen. The client has the option to decide the advisor, the services and the fee charge model that works best for them. The financial landscape has undergone a transformation. Life has become far more complex now. The goals and aspirations are many. We are living longer than ever before & hence our corpus needs to be much bigger. The stakes today have become much higher. A true advisor can help in effortlessly navigating finances & life itself. Such advisors are available for providing counsel. It’s advantage investors now.